The first hole at Moila is a straight away par 4 down hill so it often plays shorter than its true yardage. The green is fronted by two bunkers that prove challenging if found. The green is sloped from front to back. It is often beneficial to keep the ball below the hole. The second hole is a very reachable par 5 if you have a well placed tee shot. Definitely favor the left side of the fairway to leave the best angle in to the hole. Keeping the ball below the hole is a must on this small green. Bogey looms close if you find trouble off the tee or misplay your approach into the hole. One of the most scenic but visually intimidating tee shots on the whole golf course. The out of bounds right, can sneak in there quite easily. With the change in elevation a well struck tee shot can leave a shorter approach than expected. The most difficult hole on the golf course, it's a slight dogleg left with an uphill approach into the green. Finding the fairway off the tee is a must for trying to make par. The longer hitter needs less than driver off the tee. The green is sloped from back to front and keeping the ball below the hole is a definite must on this hole. By the scorecard it's a short par 5 but the uphill approach often makes it play longer than its yardage. To fully take advantage of this par 5 finding the left side of this fairway leaves the best approach. Depending on the hole location putting can present quite the challenge with this large undulating green. The start of the tough par 3s here on the front, a long iron or fairway metal of some sort is often required. The green is sloped back to front and will provide a difficult 2nd if you get above the hole. A par is well earned on #6. A hole that with a well struck tee shot you can take advantage of. Favor the left side to shorten up the hole. The toughest par 3 on the golf course, Often a very difficult green to hit, the green slopes right to left and presents quite a challenge when you have missed the green to get up and down. Par is a great score on this tough golf hole. Short for a par four but many challenges present themselves on this hole. Out of bounds runs the entire length of the hole on the right. Any shot left of the cart path on the left hand side coming up the hill is out of bounds, so a well struck tee shot is an absolute must on this hole. This green is sloped from front to back, so keep the ball below the hole for your best chance at par. A risk reward hole at its finest, it plays downhill and usually short of its listed yardage. The green is partially guarded by a tree on the right, and a bunker short and left, but most players can get their tee shot right down by the green. A very straight forward par 3, bunkers left and right are very difficult to get up and down out of. A great par 4 with a big dogleg to the right, finding the fairway is a must and will lead to short iron approach and a good birdie opportunity. This green is very large and narrow through the middle of the green, and provides a challenging putt from most places on the green. Uphill tee shot to a small green, no real good place to miss but short. It presents itself as one of the tougher par 3s at Moila even with its yardage less than 200 yards. Downhill from tee to the green, finding the fairway is a must if you want to hit this green in regulation. Water guards the entire front of the green so your approach must be well struck and to the correct distance. Approach shots that end up long of the green, leave a very difficult up and down. A hard dogleg left par 5 that is a great birdie opportunity with a tee shot in the fairway. The big hitter will challenge the left trees and go over them and have a mid to short iron left into the hole. Shot making off the tee is a must, out of bounds runs up the left side on the tee ball, so definitely take great care on the tee shot. Another demanding tee shot on this short par 5. The longer hitter can get it up to the top tier of the fairway leaving a short second shot into the hole. Hitting the fairway will leave the best play in on this hole. It's a very large green with slopes to negotiate on each corner of the green. A short par 3, but there isn't a really great place to miss your tee ball at. The green slopes from back left to the front right, so many putts are challenging on this large green. Straight away par 4, up hill the whole way, a tee shot in the fairway leaves a short wedge into the hole and a good birdie opportunity. The fairway bunker short and left leaves a very difficult approach. 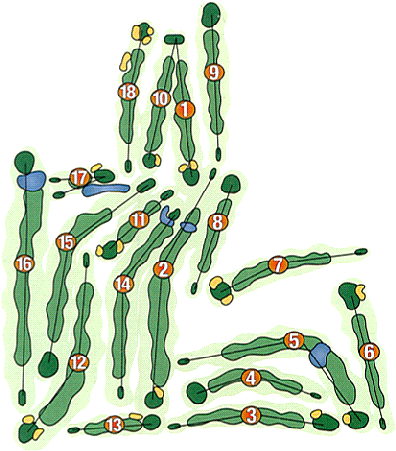 At its shorter distance, provides a good conclusion to your round of golf.